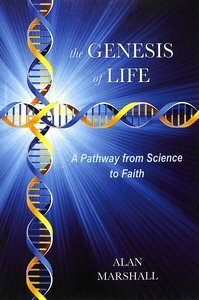 About "The Genesis of Life"
Customer Reviews For "The Genesis of Life"
I have been a Christian for many years, but I have also been a lover of science for those same years. It has been a long and often frustrating process for me to work out how to acknowledge both as truth without losing the power of one over the other. The Genesis of Life does a lot of this hard work for you, and makes beautiful sense. In some ways the book is a little like a trip back to high school - a refresher course on biology, geology, physics - but it was exciting to follow along the thought process and to make the same connections and conclusions alongside the author. There's enough technicality in the book to titillate my geeky side, and enough of God's passion to speak to me spiritually. I'm sure there are other books which address the same general ideas, but this is the first I've read and I found it very helpful. I'd recommend this book for anyone who has struggled with reconciling faith and science. I'd also recommend it to anyone who finds the whole spectrum of the sciences fascinating and just wants to hear a different perspective. Richard Dawkins and the like would have us believe there is only one possible conclusion to the questions raised by modern science; this book presents an alternative. An interesting read I came across the other day was this stimulating volume on the origins of life, entitled 'The Genesis of Life' by Alan Marshall. The subtitle - A pathway from science to faith - sums up the contents of this thought-provoking treatise. Marshall looks at some of the prevailing scientific theories, and dissects them from his viewpoint as a believing scientist. The refreshing aspect to his narrative is that he doesn't blindly refute scientific reasoning as irrelevant to faith, he brings his own analytical and scientific knowledge to bear and, in the process, seems to build an elegant bridge between two spheres of thought which, ultimately, should not be regarded as separate from each other at all. Marshall respects both faith and religion and science and reason, and in a clear and concise way forges ahead to link them or, to re-link them. He quotes astrophysicist Robert Jastrow who says: "For the scientist who has lived by faith in the power of reason, the story ends like a bad dream. He has scaled the mountains of ignorance; he is about to conquer the highest peak; as he pulls himself over the final rock he is greeted by a band of theologians who have been sitting there for centuries." I thoroughly recommend this outstanding contribution to that most intriguing conundrum of all, the origin of life itself..